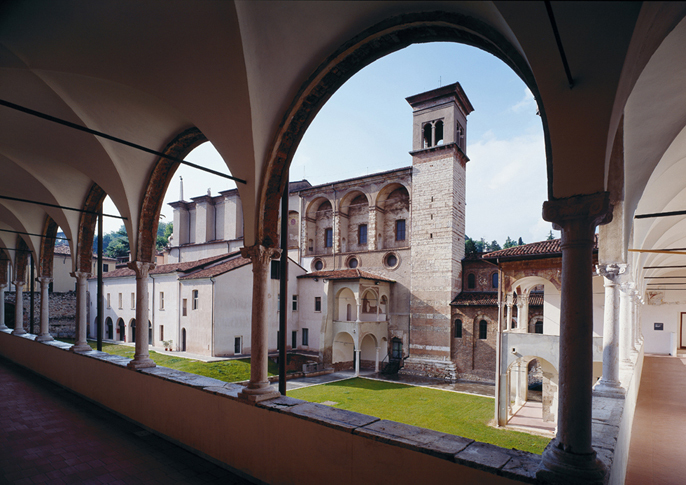 On the ruins of an ecclesiastical complex of the 7th century, the future king of the Lombards, Desiderius, together with his wife Ansa, founded the monastery of San Salvatore in 753 AD. The monastery was then dedicated to Santa Giulia under the guidance of Anselperga, Desiderius’s daughter. Around three open spaces they constructed buildings for the organization of the monastery, which was also used by the royal family. On the west side, the first courtyard reused a palatium dating from the previous century, with arches and a three-mullioned-window loggia, of which part of the façade is left; it was probably used to welcome royal delegations and as a seat for public ceremonies. The second courtyard, at the side of the church, housed a large graveyard among whose ruins we can find the foundations of a turreted building with a pillar crypt. Finally, the third courtyard was designed as a place of seclusion, where we find the ruins of early medieval buildings with heated floors. The monastery was granted special privileges that the Carolingians continued and extended after Desiderius’s defeat; thus it accumulated power and huge wealth, with possessions and economic activities spread throughout Italy. The monastery had its first drastic reconstruction in the middle of the 12th century when the cloisters were rebuilt, the crypt of San Salvatore was enlarged and the Oratory of Santa Maria in Solario was built. The last of these, perfectly preserved, had the shape of an imposing quadrangular stone building, on two levels, with almost no opening to the outside. The great transformation which gave the cenoby its present shape is largely due to the work carried out in the very last years of the 15th century. During this work there was a radical reconstruction of the cloisters with the addition of the northern one, used as dormitories. In the church courtyard of San Salvatore the choir stall of the nuns was constructed: a large vaulted room placed on the first floor to avoid any possible contact between the enclosed nuns and the parishioners. At the front of this building, at the end of the 16th century, the church of Santa Giulia was finally built, actually completed in 1599. With a few modifications the monastery remained undamaged up to its suppression in 1798 which was caused by the Jacobin revolutionary laws. Transformed into chivalry barracks and deprived of its assets, the structure suffered a progressive decay which was only partially suspended when the Museum of the Christian Age was opened to public, inside the three religious buildings, in 1882. Only after being entirely acquired by the Town Council in 1996 could the restoration work and the preparation of the new museum, be started leading to the present rebirth of Santa Giulia complex.